The Bulldog today is so sweet and docile compared to its bloodthirsty beginnings! The Bulldog was developed entirely in England and descended from ancient mastiff-type dogs. They were used in the practice of bull baiting, which involved the dog grabbing onto the bull’s nose and shaking it. Bull baiting served two purposes. The first was the belief that it tenderized the bull’s meat by “thinning” the blood before it was butchered. Secondly, it was a popular spectator sport where crowds wagered on the outcome of the struggle. In 1835 bull baiting was outlawed in England, and it was thought that would be the end of the Bulldog. However, there were a few breeders that saved the breed and started selecting only the docile tempered dogs; aggressive and neurotic dogs were not allowed to reproduce. 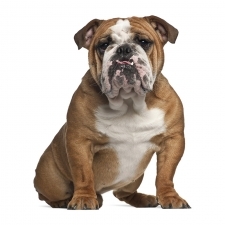 Bulldogs were brought to the United States in the late 1800s and have become one of America’s most beloved dogs. Today the Bulldog is a lover, not a fighter. They are friendly, easygoing, and get along with everyone. They form strong bonds with their family, including the children, and are tolerant of strangers. Bulldogs are very laid-back and can be quite the couch potato. They often have a calm dignity about them. They can be slow learners but once they get it, they get it. Bulldogs weigh between 40 to 50 pounds and stand approximately 12 to 16 inches tall. They are a medium-sized dog with a solid, stocky body on short legs. Their hair coat is short and smooth and ranges in color from red to white to various brindles. No other dog is as popular in the mascot department as the Bulldog. They are mascots to the U.S. Marine Corps (ooh-rah), Yale University, University of Georgia, Waldron High School in Waldron Arkansas, and many other schools throughout the nation. They drool and slobber – a lot! Over 80 percent of Bulldogs are delivered by Caesarean section, and they suffer from more airline deaths due to their respiratory issues than any other breed of dog. Warren G. Harding owned a Bulldog named “Oh Boy” and was the only U.S. President to own a Bulldog while in office.